Cobo Center is located right in the heart of downtown Detroit. For your convenience directions can be found below. 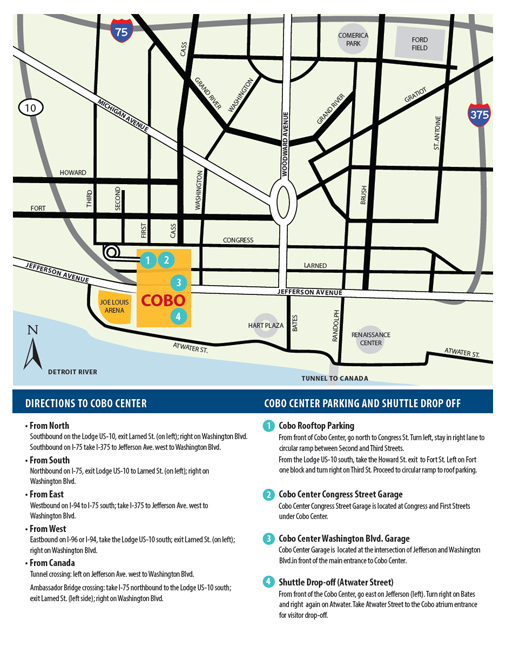 Currently, Cobo Center has 2,246 parking spaces available for a fee on a first come first serve basis at the Cobo Roof Deck, Washington Blvd., and in the Cobo Center Congress Street Garage. Cobo Center is not responsible for items left in vehicles parked in Cobo Center garages. Parking spaces in the Cobo Center Washington Blvd. Garage and Cobo Center Roof Deck can be reserved ahead of time through ParkMe online service or app at an increased rate. The Cobo Roof Deck is located at the corner of Congress and Third Streets on the roof of Cobo Center. 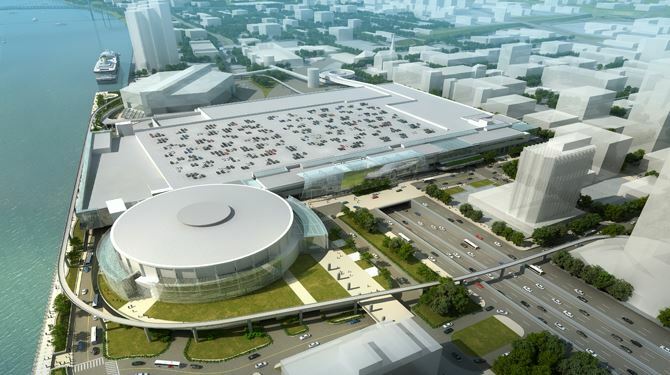 It features 1,200 uncovered parking spaces, and provides easy access to both Cobo Center and Joe Louis Arena. The Cobo Roof Deck is open Monday-Friday from 6:00 AM - 11:00 PM; hours will vary for weekends and events. The Washington Boulevard garage is conveniently located at the corner of Larned St. and Washington Blvd., underneath Cobo Center. This garage features 640 covered parking spaces on two levels. The garage is open Monday-Friday from 6:00 AM - 10:00 PM; hours will vary for weekends and events. The Cobo Center Congress Street Garage is located at the intersection of Congress and First streets, underneath the Cobo Center. The Cobo Center Congress Street Garage features 350 covered and 56 uncovered parking spaces. This garage is open only for special events and monthly parking. The Congress Street Garage is the closest covered parking for Joe Louis Arena events. Cobo Center offers full service valet parking at affordable prices for your event. For more information on valet services, please contact Parking Operations at 313-259-3540. 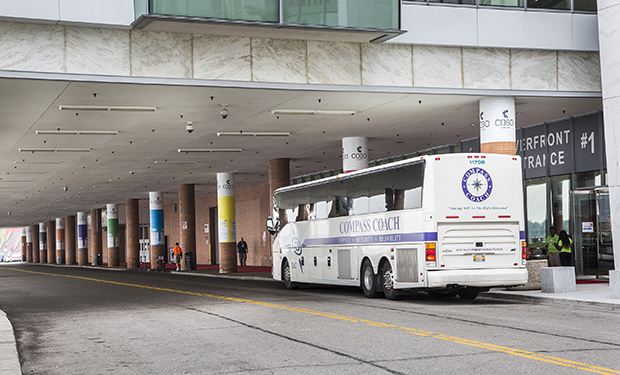 All parking areas in Cobo Center have handicapped parking spaces and wheelchair accessible facility access.